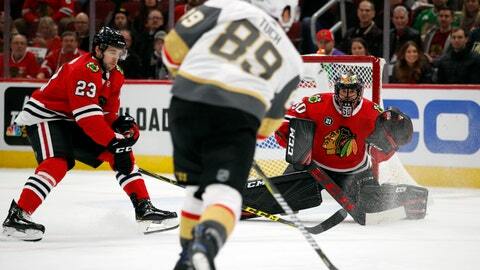 CHICAGO (AP) — These Vegas Golden Knights are beginning to look like the old Vegas Golden Knights. “If you don’t defend hard enough then you don’t give yourself a chance to win,” coach Jeremy Colliton said. Carr, Tuch and Eakin scored in the first as Vegas jumped out to a 3-0 lead. Carr got his first of the season at 2:10, Tuch picked off Crawford’s errant pass and extended his goal streak to three games at 12:14, and Eakin converted a slick backhand in front at 16:14. Fleury lost a shutout streak of 150 minutes, 54 seconds when Forsling’s shot ricocheted off Karlsson and into the net 29 seconds into the second. Karlsson responded with a power-play goal at 6:27. Theodore and Reaves also scored in the second to extend the Golden Knights’ lead to 6-2 going into the third. Eakin was credited for his 10th of the season when his shot went off Blackhawks defenseman Duncan Keith all alone in front and into the net midway through the final period. NOTES: It was the most goals allowed by Chicago at home since an 8-3 loss to Nashville on Jan. 5, 2007. … Vegas D Deryk Engelland had three assists. … Blackhawks D Henri Jokiharju was held out because of an illness. Fs Chris Kunitz and Andreas Martinsen also were scratched. … Blackhawks D Brandon Davidson had right knee surgery. He is expected to be sidelined for six to eight weeks. … It was Strome’s second multipoint performance in 49 NHL games.